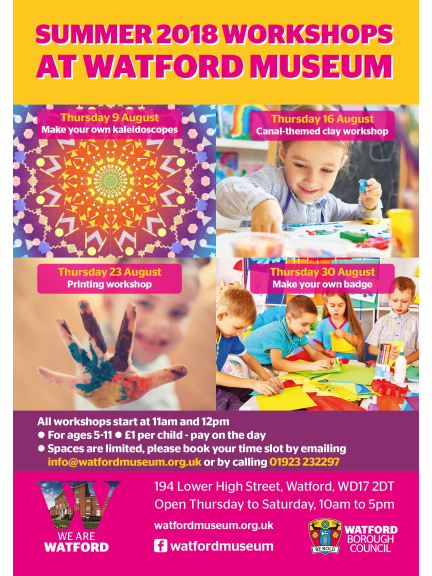 Come along to Watford Museum this month where you’ll have the chance to take part in a number of fun and creative workshops. The four different sessions, suitable for 5 to 11 year olds, costs only £1 per child per workshop, all have a different theme which allow children to use their imagination and creativity to produce works of art. There will be two session times for each workshop and spaces are limited, so please book by emailing info@watfordmuseum.org.uk or call 01923 232297. Watford Museum is open from Thursday to Saturday, 10am to 5pm. Admission to Watford Museum is free.